Bladerunner meets Jim Butcher in Afterlife, a thrilling urban fantasy noir adventure set in an alternate world where everyone gets nine lives. In the vein of J. D. Robb’s bestselling ‘In Death’ series, author Merrie Destefano blends a futuristic concept with gritty noir mystery for a riveting story of murder, conspiracy, and multiple-resurrections that will appeal equally to fantasy, science fiction, and mystery fans. 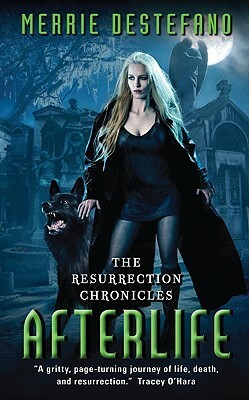 Even paranormal romance lovers will find something to love in Destefano’s extraordinary Afterlife. Merrie Destefano left a 9-to-5 desk job as a magazine editor to become a full-time novelist and freelance editor. With twenty years' experience in publishing, her background includes editor of Victorian Homes magazine and founding editor of Cottages & Bungalows magazine. She lives in Southern California with her husband, their two German shepherds, and a Siamese cat.